Finding a place to eat as a vegetarian in Zagreb proved to be (more than) slightly difficult. Obviously, you can always have a pizza Margherita or a burek with cheese, but in case you want to taste anything other than a version of bread and cheese combination, you’ll have to try hard. There are various approaches to vegetarianism in Zagreb. Some of the waiters find it annoying that you have “special requests”, while the others consider a chicken salad to be a vegetarian dish. In other places, they will “totally understand you”, but can only offer potatoes and some lettuce. That being said, the climate’s definitely changing and I see a bright future for non-meat eaters in the years to come. Until then, there’s Green Point. 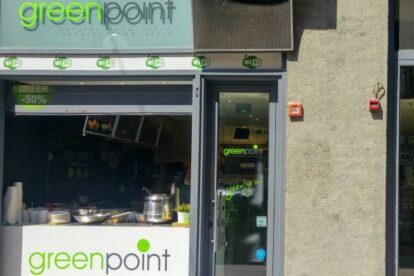 Green Point is a vegetarian and vegan street food restaurant: they offer tofu, seitan or hemp burgers, tortillas, wok dishes and a variety of shakes and smoothies. It’s not a restaurant you’d want to spend a lot of time in, though – it’s a tiny place with a few high tables and chairs so guests either eat quickly or take the food out. Nevertheless, it’s one of my favourite places in town. The staff’s friendly and smiley and they seem to take pride in their work. The food’s tasty, too! The biggest plus is that you never need to worry about any secret bacon “for the taste”. I couldn’t ask for anything more!